Douglas is a village in South Lanarkshire, Scotland. It is located on the south bank of the Douglas Water and on the A70 road that links Ayr, on the West coast of Scotland, to Edinburgh on the East, around 12 miles south west of Lanark. The name Douglas is of Gaelic origin, dubh-glas meaning dark greey/green, in reference to the river. The Douglas family took this name when their ancestors settled here in the 12th century. In medieval times, the village grew to service the nearby Douglas Castle, the seat of the "Black Douglas" Earls of Douglas. The castle and village were well established by 1300, and were occupied for some time by English forces during the Scottish Wars of Independence. However the castle was liberated by Sir James Douglas when in 1307 he and some followers trapped the English garrison inside the Castle chapel whilst they were worshiping and burnt it to the ground, causing some damage to the castle. 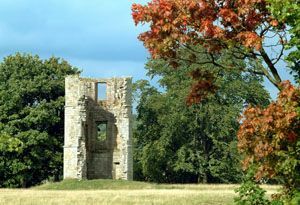 The only remains now are those of a 17th century corner tower, still known as "Castle Dangerous", after the Walter Scott novel which took Douglas Castle as its inspiration. In the 1930s Charles Douglas-Home, 13th Earl of Home allowed the mining of coal in the park near to the castle, in a philanthropic effort to alleviate local unemployment. The Lanarkshire coal industry, once the mainstay of Scotland's production, had seen its output almost halved by 1937, with catastrophic consequences for local communities. As a consequence of the mining works the castle was considered to be at risk of subsidence and had to be demolished in 1938. The oldest structure within the village itself is the ruin of St. Brides Church, which like the castle originated in the 14th century. This church became the mausoleum of the Lords of Douglas. The church clock, which is still in working order today, and installed sometime in the 16th century, is roumered to have been given as a gift to the village by Mary, Queen of Scots, after spending time in the area. 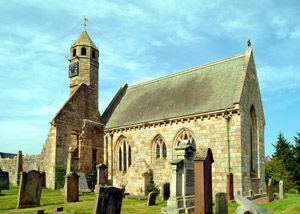 The parish church was moved to its present site, near to the old chapel, where the Douglas St Brides Parish Church still stands. Its congregation now worships at the newer St Brides Church built some distance away. Within the village stands a statue to one of the Covenanters, James Gavin who was persecuted for his religious faith and had his ears cut off with his own tailoring scissors for refusing to renounce it. After suffering this humiliation he was transported to a life of slavery in the cotton fields of the West Indies. The ruins of his house stood until 1968 with the tailor's engraved lintel still in place above the front door. The lintel has been incorporated within the monument erected in the rear garden of the house. 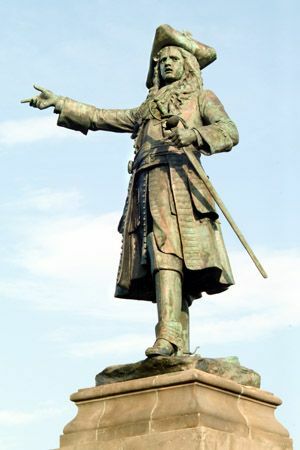 Also within the village is a statue of James Douglas, Earl of Angus, commemorating the Cameronians regiment which he raised in 1689. 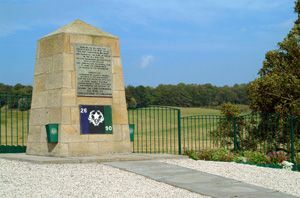 Nearby, another memorial commemorates the disbanding of the Cameronians in 1968. 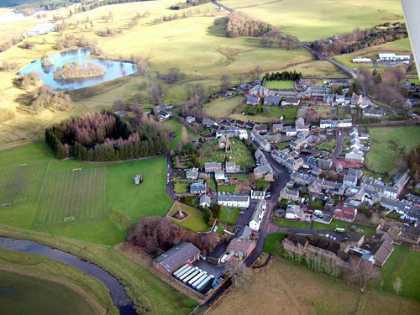 The village was shaped later by the Industrial Revolution, which brought woolen mills and coal mining (in common with other villages in this part of Scotland). Laterly the village and the surrounding valley has been drastically reshaped by the blight of open cast coal excavation as well as dwindling employment opportunities due largely to the closure of the indigenous local factories and businesses. There is a heritage museum in Douglas that charts the history of the area.